While the word ‘aerosol’ conjures up images of spray cans, to atmospheric scientists the term refers to something different: small particles suspended in the atmosphere, often many times smaller than the width of a human hair. Aerosols can be natural or anthropogenic (the result of human activities), and include substances such as mineral dust (blown from deserts or bare soil by the wind), smoke (from wildfires as well as intentional burning), ash and sulphate from volcanic eruptions and degassing, sea spray, haze from industrial activities or vegetation emissions, and more. We care about aerosols for many reasons. By scattering and absorbing light in the atmosphere, and interacting with cloud development they affect weather and climate. This interaction with light can also influence potential yields from solar power plants (as well as the deposition of dust on to solar panels themselves, which then must be cleaned off). Dust and ash in the atmosphere can be hazardous for aircraft and ships, requiring alteration or cancellation of routes in real-time. High levels of aerosols near ground level cause poor air quality – particularly prominent in the news these days in megacities such as Beijing and New Delhi, but by no means restricted to them – which can cause health problems in humans (as well as other animals, and damage to plants). On the other hand, nutrients carried in mineral dust can fertilize distant ecosystems after being blown long distances; studies suggest, for example, that the Amazon receives a large input of phosphorous from dust sources in the Sahara Desert, especially the Bodélé depression in Chad, thousands of miles away. 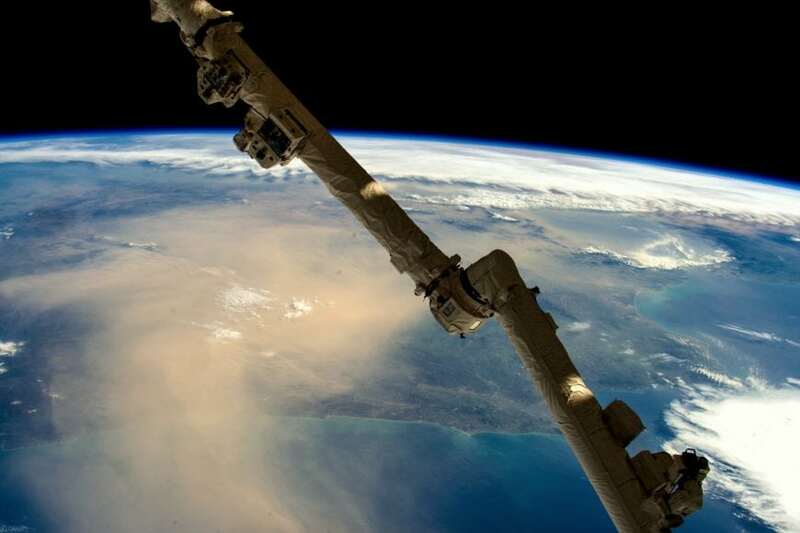 Similarly to how we can see these events like dust storms from the ground, we can also see them from space using satellite instruments designed to measure this reflected sunlight. Algorithms have been developed using a variety of satellite instruments to use these measurements to quantify the amount and sometimes the type of aerosols in the atmosphere. This is a difficult problem because these algorithms must be able to take account of other factors which influence the brightness of the light seen from the satellites. One example is reflectance from the underlying surface, particularly over land, which is brighter, and more variable in space and time, than the oceans. A second is the presence of clouds, which must be distinguished from aerosols, and block the view of aerosols and the surface below them. One shortcoming to date has been that the types of instrument which can quantify aerosol loading over land robustly have only been flying since around the start of the 21st century. To understand how aerosols have changed, it is desirable to have a much longer time series, particularly for developing countries which often saw large industrialization and growth during the late 20th century. Prior to these recent more capable sensors, the main long-term record of optical measurements was from a series of instruments known as the Advanced Very High-Resolution Radiometers (AVHRRs), which began flying in 1979 and continue to the present day. These had not been used widely for aerosol monitoring over land before, mainly because they lack measurements at several of the main wavelengths used for monitoring aerosols over land and their digitization (for the earlier members of the series) meant that the data could be noisy. Recently, a team led by scientists at NASA’s Goddard Space Flight Center in Greenbelt, MD in collaboration with Universities Space Research Association (USRA), the University of Maryland, and Science Systems and Applications demonstrated a proof of concept to fill this gap in the over-land aerosol time series. They adapted the so-called ‘Deep Blue’ algorithm, which is routinely applied at NASA to process data from a number of satellite instruments, including the MODerate Resolution Imaging Spectoradiometers (MODIS), to work with AVHRR data. The team demonstrated this by processing data from three of the existing AVHRR missions, and compared this to MODIS data as well as ground-based observations, to validate their adapted algorithms. Although the AVHRRs are inherently more limited, the team demonstrated that it is possible to extract quantitatively-useful aerosol information from these sensors. They now plan to apply their new algorithms to the full AVHRR records and merge them with MODIS and other advanced sensor records, more than doubling the available length of Deep Blue data sets and improving our understanding of how and where the Earth’s aerosol burden has been changing. These findings are described in the articles entitled Evaluation of NASA Deep Blue/SOAR aerosol retrieval algorithms applied to AVHRR measurements and Retrieving near-global aerosol loading over land and ocean from AVHRR, published in the Journal of Geophysical Research. This work was led by Christina Hsu from NASA’s Goddard Space Flight Center and Andrew Sayer from GESTAR/USRA at Goddard.